Let Regal Custom Builders help you design your home’s perfect deck or patio to share with family and friends. 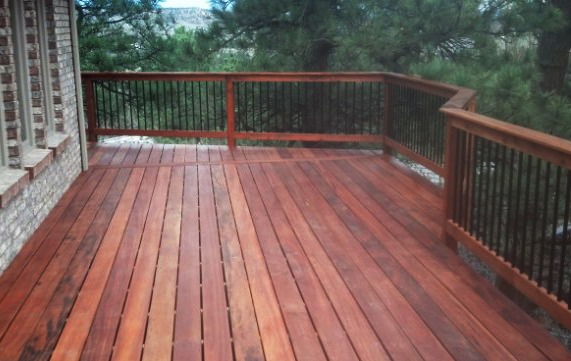 Here’s an El Paso County secret: A deck is actually a four-season room. Regardless of what the calendar says, any evening can be an opportunity to enjoy the Colorado Springs vistas from a beautifully constructed deck or patio. Let Regal Custom Builders work with you to design your home’s perfect outdoor space to share with family and friends. If you envision an expansive custom deck with a built-in grill and fireplace, or a covered patio with integrated lighting, Regal Custom Builders can construct the outdoor space of your dreams. Using superior, maintenance-free products, such Trex, Evergrain, exotic hardwood, and redwood materials, as well as a team of talented, experienced craftsman, Regal Custom Builders will create a gorgeous outdoor addition you’ll love to use year round.